You may probably be asking yourself this question if you have a toddler and you are expecting a newborn anytime soon, “what is the best Sit and Stand Stroller?” Sooner or later your older child’s stroller will be useless as you welcome your other new member of the family. The older child will still be in love with the stroller and will want to ride on it just like the little newborn, so what are you going to? The best Sit and Stand Stroller will be the best solution in such a case. Sit and Stand Strollers are made to give your older child freedom to ride in the stroller and to get off it at will. These types of strollers are perfect for a family with two children having some age gap between them. We have therefore tried to give an answer to your question by reviewing five of the best Sit and Stand Strollers in the market today. So keep reading to find more about these strollers. Do you like doing routine walks or runs and you have two kids of different ages? This stroller offers two seats that can hold up to 50 pounds of weight. The front seat will suit your younger child as it has a recline position. You can, therefore, place it in a flat position so that your baby can have a comfortable naptime. The rear seat, on the other hand, is padded for extra comfort for your older baby. If your child also feels like she can stand as you drive the stroller, she can stand on the sturdy platform. Infants are also not left out either. You can still connect your baby’s infant seat though there might be some limitations here. 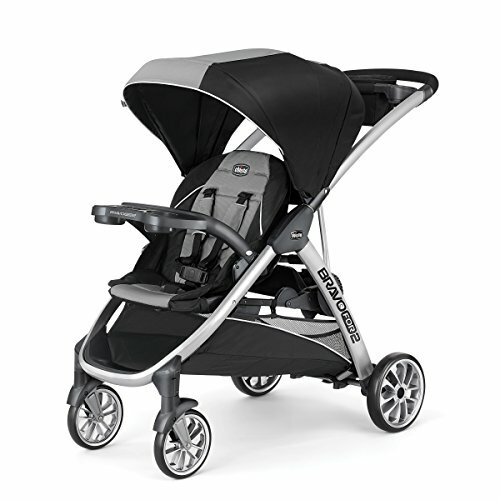 This stroller is compatible mostly with Graco Classic Connect and Click Connect infant seats and not any other models of infant seats. To ensure that you have quick transitions between your daily life routines, the stroller has a one hand fold for quick lifting into your car’s boot or for storage. It also has swiveling front wheels with in-built suspensions for a comfortable ride. Seats withstand up to 50 pounds. Front and rear sitting platform. Can accommodate two children, one sitting and one standing. The rear sitting bench is padded for snugly ride. The front seat has a multi-positional recline which can provide a position for baby’s naptime. Infant car seat can be attached at the back. It has a one-hand fold for quick storage. Does not stand when folded which makes access to the storage basket difficult. Baby Trend has built a Sit and Stand Stroller that will be good for your older child and the little one at the same time. It has multiple seating options for both your grown child and the little one. The first seating option is where one child can sit in the front, and another can stand at the back. 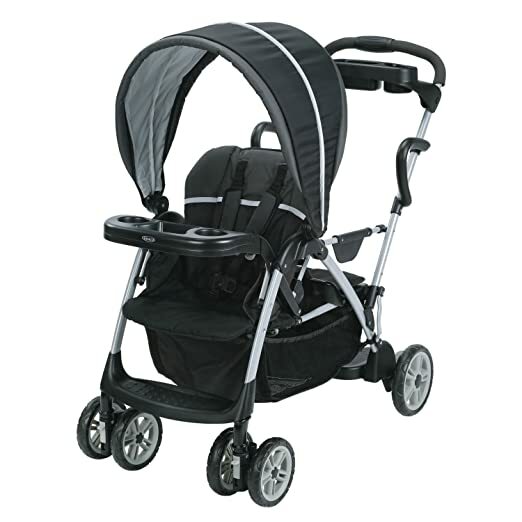 This will allow your baby to conveniently get on and out of the stroller wherever she feels so. The second seating option is where an infant car seat can be attached at the back and then the other child can sit at the front. This will be good if you are a parent whose older child still loves to sit on the stroller seat and won’t let go. You can just, therefore, attach the infant car seat at the back and let your lovely children ride it safely. To ensure that the standing child has refreshment drinks as you stroll around, there is an added parent cup and standing child cup holders. For the front child’s protection from sun rays, the seat is fitted with a canopy. There are also baby accessories and item storage basket beneath the stroller seat. Parent, standing and front child cup holders. It can conveniently accommodate two children, one sitting and the other standing. It can accommodate infant car seats for two children sitting positions. Comes with parking brakes for safe parking. The front wheels swivel for great maneuverability. Comes with a parent, standing child and sitting child cup holders for refreshments and drinks. It has a storage basket and can be compactly folded for easy transportation. It is heavy and cumbersome. Just like the other two Sit and Stand Strollers, this falls into the category of the best Sit and Stand Strollers. This one has a new added lean profile where your older child can lean on while she rides in the stroller. Your child can also choose whether she can stand or sit which gives independence in making decisions. You will also not have to attach any standing platform for your baby to stand on. Instead, it comes with a built-in stand on the platform. The child can also sit on the rear bench for a comfortable ride. If you are expecting a newborn soon, your baby will not be left out as this stroller has an infant car seat adaptor that is universal. You can also install the infant car seat in a manner that your baby will be facing you for a close monitoring. On the front, there is a child seat with a large canopy with a visor. The seat is a 3 positional seat. What’s more, it has a linked parking brake and the suspended four wheels for your baby’s safety. The seats can each withstand a capacity of 45 pounds. Front seat and rear bench. Canopy with an extended visor. Comes with a universal adaptor that fits most of the major infant car seat brands. Has a 3 position recline seat for letting your baby sit comfortably. The seat has a large canopy with an extended visor for maximum protection from sun rays. For safe parking, the linked braking system can be used. The wheels are suspended meaning the children will enjoy the smooth and uninterrupted ride. The wheels do not swivel with ease making maneuverability hard. What makes this best Sit and Stand Stroller unique is the fact that other than being a Sit and Stand Stroller, it can allow two infant car seats to be installed on it. While it may be used for strolling two infants, your older child can still ride on it provided she is not more than 50 pounds. Your child can ride on this stroller while forward facing or rear facing. The same child can still sit on the rear bench seat or the front seat if your infant seat is installed at the back. On it is a child tray that can easily swing giving the baby access to the front seat. The tray can hold cups and snacks. What’s more, on this stroller is also a storage basket for keeping baby changing gear or your items. You will also be accessible to a foot activated brake that you can use when parking or controlling the motion of the stroller. Weight limit of 50 pounds per child. Can accommodate two children each of up to 50 pounds. Two infant car seats can be installed on it. On the front is a child tray that can swing giving the baby easy access to the front seat. It has a quick compact fold for easy and quick storage. On it is a large basket to fit the parent’s and baby's items. Has a widely extended shade. The shade is large in such a way that the standing baby has to learn to avoid hitting the head on the shade. 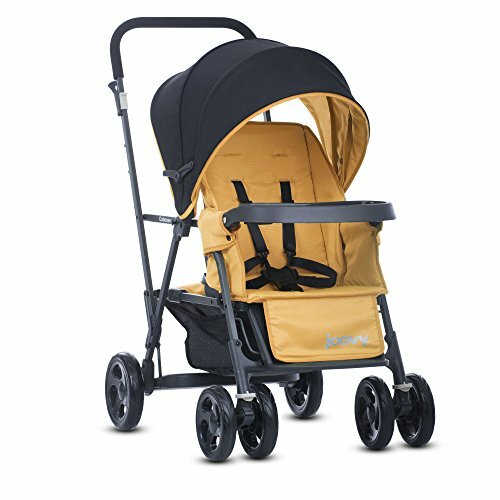 This uniquely designed 2 passenger stroller will be the best choice for every parent to buy for their kids. It has a stroller seat for your younger baby and an extra rear bench seat for your older baby. The baby might also choose to stand at the rear standing platform. If you will be expecting a newborn or you have a newborn already, you won’t be left out. This stroller will still be able to take care of both your children including the younger one. To ensure that your older child riding at the back is also secured there is a 3 point harness. The platform is grip enhanced while the seating bench is padded for more safety. If the old child chooses to stand, the rear seat can be folded away to give more room for a free and comfortable stand. The stroller seat, on the other hand, has a 5 point harness for securely keeping your younger child in position. It also has a removable canopy for protection from UV-rays and a removable cup holder tray. You are also not left out as it has an apparent tray with zip storage for storing items like phones and car keys. Compatible with KeyFit or Fit2 infant car seat. 5-point harness for front 3-point harness for the rear bench. The main stroller seat folds away giving room for the infant car seat to be installed. The multi-point harnesses on both front and back seats allow safe ride for the babies. The rear seat folds away giving the baby more room to stand. The standing platform is grip enhanced, and the rear bench is padded for the comfy and safe ride. Comes with removable child tray, the standing child pocket and parent tray with zip storage for storing parent items. The infant car seat fits with a click and can be folded with ease. This stroller is long and bulky. Owning the best Sit and Stand Stroller is a gateway to having the best walking time with your joyful babies. Sit and Stand Strollers like those discussed above despite their limitations will still give the best performance in enhancing you and your little one's mobility. We would have loved to recommend all of them, but because we are here to help you make a good choice, we would like to recommend Graco Roomfor2 Click Connect Stand and Ride Stroller. What makes it stand out from the rest is that the front seat has a multi-position recline that will allow you set a position for your baby’s naptime. The rear seat is also padded for your older baby’s comfort. 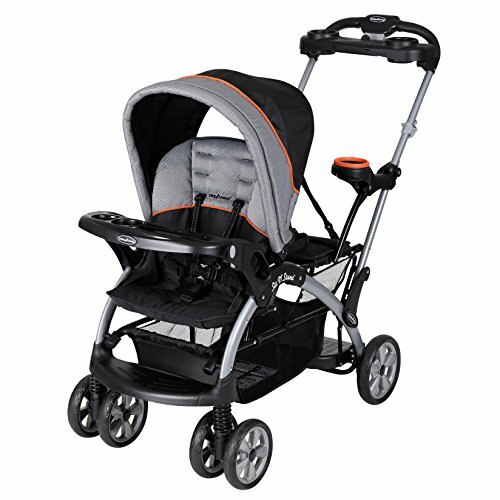 An infant car seat can still be connected to this stroller hence if you have newborn, you are not left out. The folding mechanism for this stroller is one hand operated, easy and very effective which makes transition activities simple and easy. The wheels are also good in swiveling and have good suspension for a smooth ride. And finally, just like the other four, your older baby can stand on a sturdy platform that is grip enhanced, and the seats have a high weight capacity of about 50 pounds. Weight is an important factor to give much consideration. 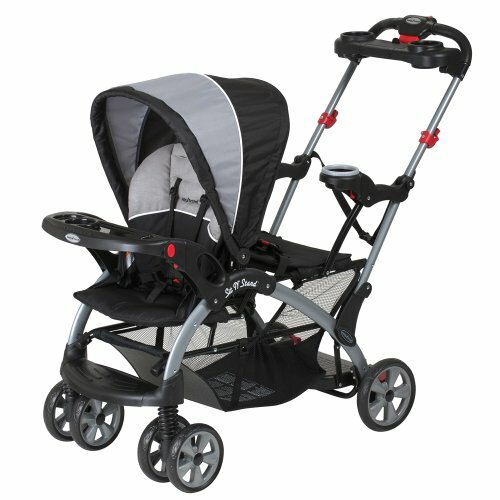 How fast or easy you will be handling the stroller will depend on the weight of the stroller. Things will get more bulky with a heavy stroller. You don’t want to be struggling to push a heavy stroller with two of your well-fed babies on it. You should, therefore, look for that stroller that is lightweight but not so much light because lightness attracts fragileness. The need to install an infant car seat on your Sit and Stand Stroller will be paramount if you have a newborn. The normal stroller seats are designed for a little-grown child. If you have a newborn, you should look for a Sit and Stand Stroller that allows installation of infant car stroller and if possible should be compatible with most of the major brands available on the market. A versatile Sit and Stand Stroller will be an excellent choice for you. You would want to have a stroller that will not only serve your child when an infant but also throughout the infancy and toddlerhood. Just like any other mobile devices, mobility is one of the greatest things to watch on when buying Sit and Stand Strollers. A mobile Sit and Stand Stroller should have fast swiveling wheels. The front wheels should be good in maneuverability. If you will be buying the stroller for your walking or running routine, how the wheels turn and swivel will be a huge consideration. You should also pay a closer look at the size of the wheels; large wheels perform better in harsh terrains. Consider the construction and even suspension in your quest for the best Sit and Stand Stroller. Many people tend to take the safety of strollers lightly. They may turn to be tragic sometimes. For the sake of the safety of your children, ensure that the stroller you are going for has a brake system installed. These brake systems are good for controlling motion and for parking. Hand brakes are good although others come with foot activated brakes which may seem a little inconvenient. Sit and Stand Strollers have so many parts compared to just a sit stroller. There are extra standing platforms, rear seat and canopy together with many more accessories that will cater for the second baby. 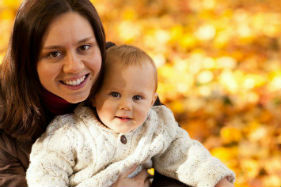 It is for this reason that Sit and Stand Strollers may seem to be bigger than the normal strollers. Nonetheless, a good manufacturer should find a solution to this by for example designing a stroller with a compact fold, detachable child tray and removable canopy in an effort to reduce the size and cumbersomeness when storing or transporting it. 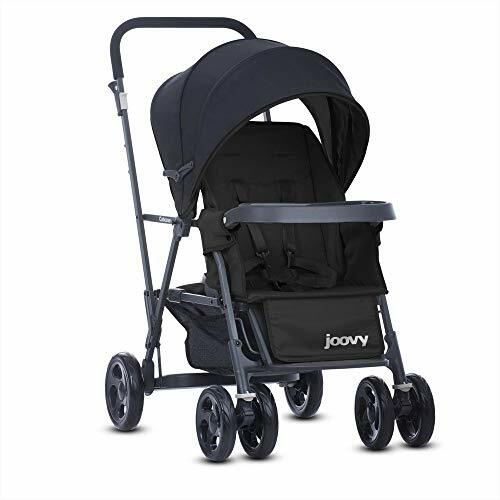 You should, therefore, look for how the brand maker has tried to help you minimize the size of the stroller so that you can quickly load it into your minivan or lift it back for storage with ease. A device to be used by children will never be complete without confirming its safety. A safe Sit and Stand Stroller should have safety belts for both children. The front child should at least have a 5-point harness while the rear child should have a 3-point harness. The standing child should have maximum safety; ensure that the standing platform is grip enhanced so that your baby can comfortably stand on it. A canopy will also be good for keeping the baby from harmful rays. Look for approval statement also. The stroller should be approved to be used as a mobile device by organizations like JPMA. These are some of the features that if you consider carefully will help you in finding the best Sit and Stand Stroller for your lovely kids. Have you ever bought for your children any of the best Sit and Stand Strollers that we have reviewed? If you have not, please consider any of these strollers the next time you will be planning to buy one. I am searching for some informative article on sit and stand strollers on the internet for the last couple of weeks. Fortunately, I have found this one and this is very much useful and informative. Sometimes some articles make us confused and unable to decide which one is perfect for me. but you describe everything in a proper way with a nice explanation in this article. Thank you so much. Keep up your good works.